If you follow me on Instagram, you'll know I recently came back from a short trip to Tokyo. It was my first time visiting Japan but it definitely won't be my last. I won't lie and say the 13 hour flight was pleasant but once you get there, the food and people make it all worth it. Oh, and the beauty selection is absolutely insane! Naturally I had prepared a beauty shopping list well in advance because there were a lot of Japanese brands I wanted to try that are either unavailable here completely or very overpriced. 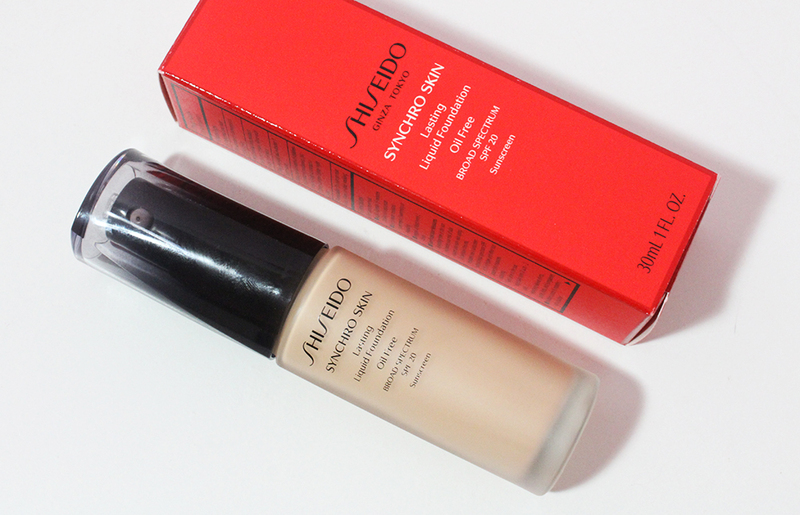 One of the things I knew I wanted to get was the Shiseido Synchro Skin White Cushion Compact because the Shiseido Synchro Skin Liquid Foundation is my favorite and most-used foundation. 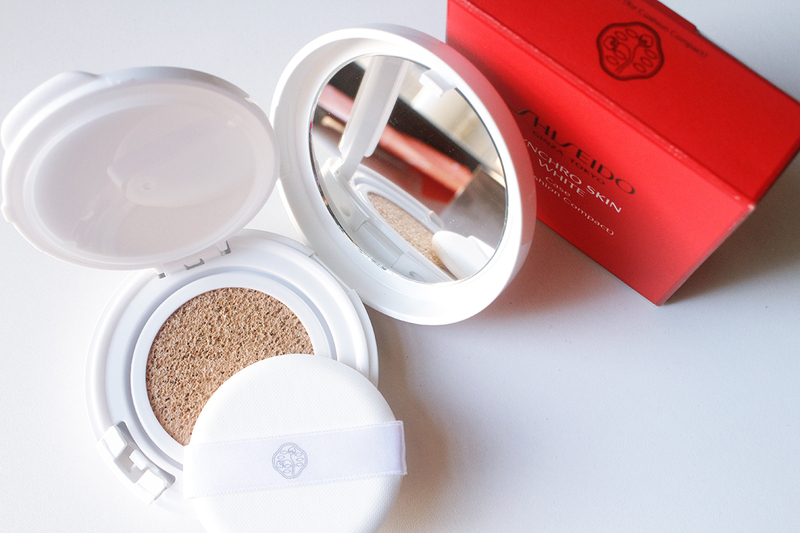 Shiseido has two Asia-exclusive cushion compacts, the other being the Synchro Skin Glow Cushion Compact that comes in a black case. I originally intended to pick that one up but the sales associate told me the white cushion had more coverage and was more similar to the foundation I love so much. Let me go off-tangent for a second and talk about my experience buying this cushion. I went to Isetan's flagship store in Shinjuku at around 6pm on a Friday with the intention of picking up this cushion and browsing the THREE, Addiction, Suqqu and RMK counters. I was not mentally prepared for the number of people who would be shopping the beauty section but wow, I have never seen so many customers and sales associates in a department store like that. You would have thought they were giving away product! I'm used to going into a half-empty Bloomingdales or Saks and having the testers all to myself. Nonetheless, I was determined to at least get this cushion because I knew I'd be able to find THREE and Suqqu at Narita the next day when I was flying home (that haul to follow at some point). The sales woman who helped me was very gracious but unfortunately didn't speak much English. They do have Chinese-Japanese translators on hand so I was able to sort of communicate in broken Mandarin with my boyfriend's help. Maybe it was because I went on this shopping trip sans makeup after a long day of sightseeing but the sales associate seemed to really want to help me put some of this foundation on before I purchased it. I don't like getting my makeup done at counters because I find it rather unsanitary (but given how clean everything is in Japan, it might have been different). I noticed a lot of women getting their makeup done at the counter - maybe that's how they usually sell products? I feel like that's gone out of style a bit here in the states. I would have actually purchased both cushions by Shiseido since they're unavailable in the states. Well, why didn't I? A very simple reason - the price. These are freaking expensive cushions! 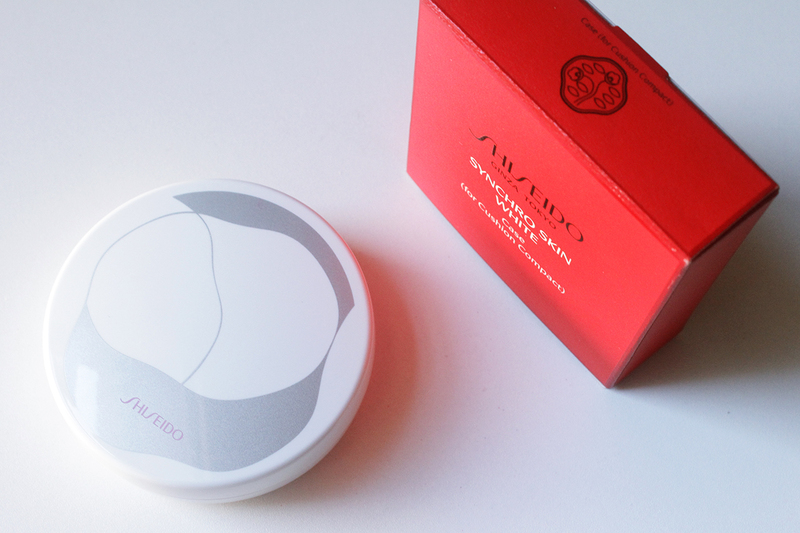 Shiseido sells the compact and refill completely separately and there's no second refill. It's one refill per pack. The case retails for JP¥ 1,200 (~$10.50) and a single refill is JP¥ 4,300 ($37.80). There was an additional tax of JP¥ 440 - I later received JP¥ 380 back from Isetan's duty free counter minus the JP¥ 60 service fee. All in all I paid about $49 for a 12 gram cushion foundation.... This is the most expensive cushion foundation I have purchased to date because it does not come with a second refill. Besides the exorbitant price, another negative right off the bat is that this cushion only comes in six shades. That might sound like a lot but it's more like three because half are neutral toned and the others are golden toned - the actual shades are all pretty light. The deepest shade is Golden 4 which isn't dark at all because my shade is Golden 3. Now that I've got the bad stuff out of the way, let's talk about the positives. For the price, there better be a lot of positives. The formula contains SPF 40 PA+++ and "smart skin" technology that absorbs excess sebum and diffuses light. It also claims to provide buildable coverage with a weightless, comfortable formula. Surprisingly I couldn't find mention of specific skincare benefits. Given the name I would think this would claim some kind of brightening or whitening effect but I didn't see that to be the case. Given that this cushion's main selling point is the natural coverage it provides, let's see how it performs. On the left I have on a little bit of the YSL Touche Eclat Blur Primer and nothing else. On the right I have one layer of the Synchro Skin White Cushion applied with the accompanying cushion puff. You can see that the coverage is certainly good. The redness on my cheeks and around my nose is pretty much gone and my angry acne scars are covered up as well. 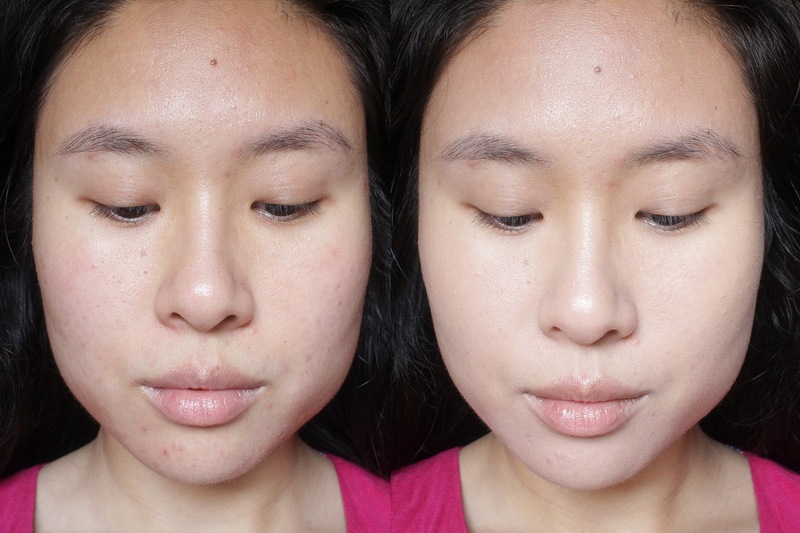 I've been using my Dior DreamSkin Cushion a lot lately which has very low coverage and this is a very different look upon initial application. The formula is quite matte compared to other cushions I've used but it doesn't look flat or dull. 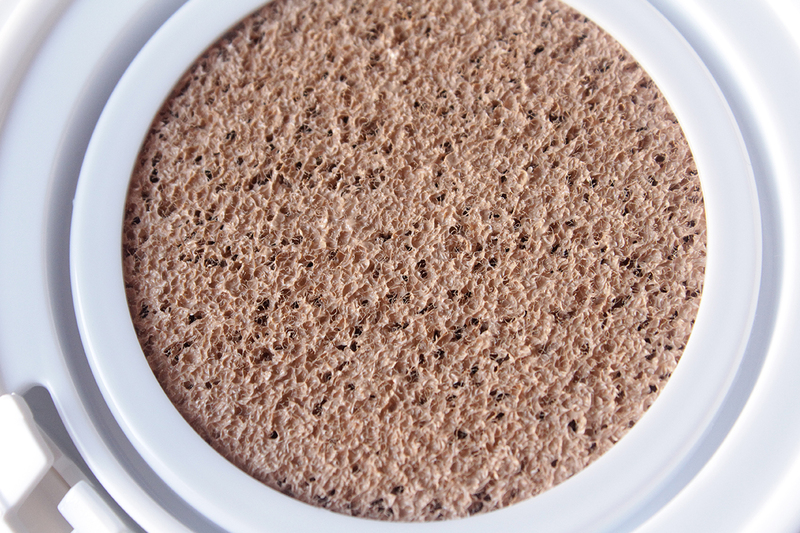 If you have dry patches, you need to moisturize very well before applying this. The cushion looks more natural once it has some time to meld into the skin. While my nose did get shiny after five hours even after setting with powder, the product didn't break up or cake on my skin. It stayed comfortable to wear throughout the day though I wouldn't say my skin felt more hydrated. The overall look of this cushion is very similar to the Synchro Skin Liquid Foundation but I like the way the original foundation applies better because it has a more watery texture. I also think the lasting power of the liquid foundation is superior to the cushion. I don't dislike the cushion by any means but for the price and the fact that I can't easily get this even if I loved it, I'll stick to the $45 foundation which gives you more than double the amount of product. My makeup current obsession is all about fresh, dewy but not shiny skin - almost all my makeup purchases from my trip were base products. Cushions are some of my favorite base products to use because they're so darn easy and I can actually finish them up. I somewhat impulsively purchased a duo pack of the Sulwhasoo Perfecting Cushions (that's four refills in total) when I was at Changi duty free. I haven't tested out that cushion yet but keep an eye out for that in the next couple of weeks! Are you a fan of cushion foundations? 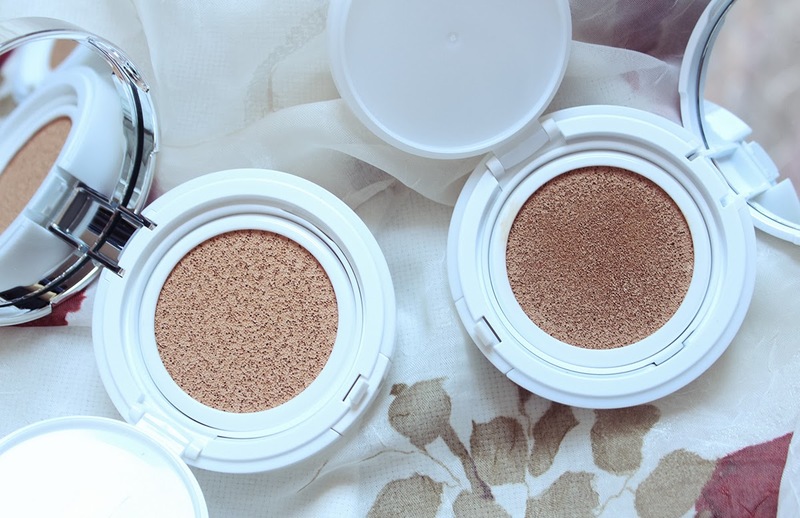 What's the most you're willing to pay for a cushion compact?